I bought Alice Cooper’s Killer album last month. That’s right, I’m 30 years old, and I went out and laid down $8.99 for the record with “Dead Babies” on it. Now some people might think: “How immature. Doesn’t the guy have any taste?” But I don’t care. In fact, tomorrow I think I’ll go out and buy a copy of School’s Out as well. From where I stand, Alice Cooper’s early ’70s albums contained some of the best, most musical guitar-rock tunes ever recorded. Killer alone boasted a whole batch, songs like “Under My Wheels”, “Be My Lover”, “Desperado”, “You Drive Me Nervous”, and “Yeah Yeah Yeah”. 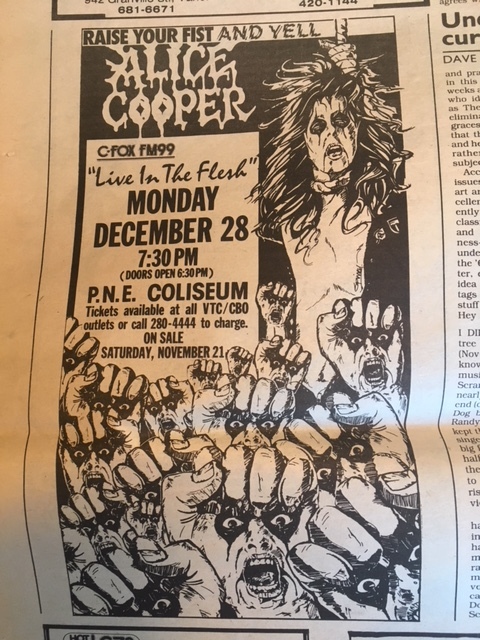 Those old gems are the main reason I’m going to see Alice Cooper’s concert at the Pacific Coliseum on December 28, his first local appearance since he injured himself falling off the Coliseum stage in 1975. Cooper’s return to the concert scene kicked off in Detroit on Halloween night of last year. According to Alice, who called the Georgia Straight recently, it didn’t take long to get back into the live groove. 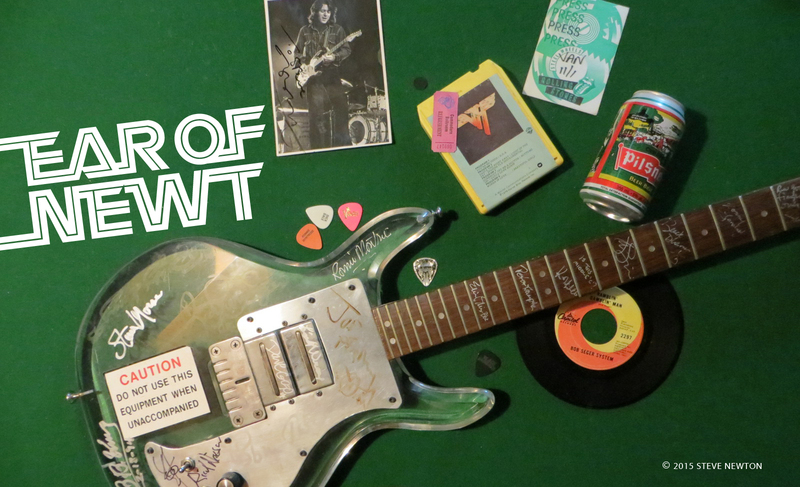 Although Alice Cooper’s latest album is selling well among today’s teen headbangers, those of us who thrived on his earlier work can see that it’s worlds apart musically. The new songs just don’t have the staying power as the old, although Cooper denies that they are a contrived attempt to jump on today’s metal bandwagon. “There is more of a metal flair to it” he says, “but I really don’t want Alice to live in the past at all, you know. And even when we do a song like ‘No More Mister Nice Guy’ or “Under My Wheels’, we’re doing it 1988-style. Nowadays Cooper’s band features flash guitarist Kane Roberts, a musclebound Rambo type who has speed to burn. His style is a lot different from that of original axemen Michael Bruce and Glen Buxton, who were both powerful and tasty as hell. Cooper’s recording career took a down-turn after the original lineup folded, but he says that today there are no bad feelings about the breakup. In fact, his old rhythm section–bassist Dennis Dunaway and drummer Neil Smith–came down to visit Alice at his show in New Haven, Connecticut last month. Not real autopsy, of course, although Cooper is famous for spilling his fair share of fake blood on stage. He was mixing horror and rock way before Gene Simmons thought it would be nifty to pretend he was a demon and spout red soup. However, Cooper’s grisly shenanigans have not won him a place in the hearts of do-gooders like the United States’ PMRC (Parents Music Resource Centre). 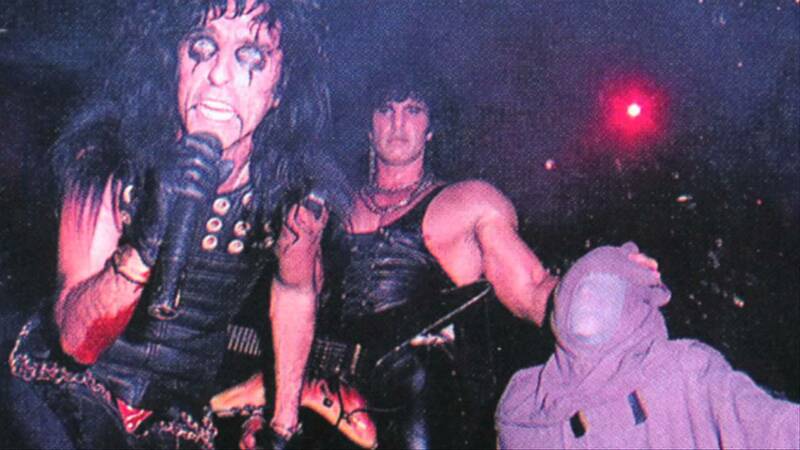 Has Alice Cooper’s rebellious stance and willingness to expose the nasty side of life caused the group to be banned anywhere lately? “Well, we haven’t been banned yet, but I’m sure it’s coming up, ’cause we’re going down to the south next, and that’s where they like to ban you. We’re going to be doing Nashville and Louisiana next, that whole area, and I got a feeling that they’re waiting for us down there.